To Dog With Love: Win With FitDog Friday Fall Fitness Challenge and ABOUND! $900+ in Prizes! Win With FitDog Friday Fall Fitness Challenge and ABOUND! $900+ in Prizes! 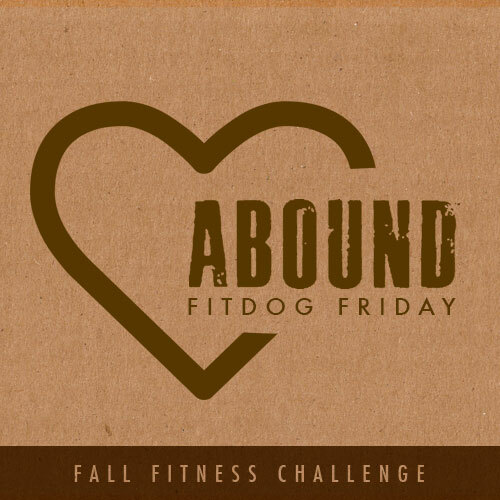 We are partnering with ABOUND to bring you the FitDog Friday Fall Fitness Challenge and giveaway. Prizes will be provided and shipped by ABOUND. To Dog With Love only shares information we feel is relevant to our readers. ABOUND is not responsible for the content of this article. We are super excited to announce today a very special FitDog Friday event! Now that it's October and the holidays are right around the corner, so are those unwanted pounds that can so easily pile up on both you and your pet! That's why along with our FitDog Friday co-hosts SlimDoggy and My GBGV Life, we are excited to bring you the FitDog Friday Fall Fitness Challenge with our terrific sponsor ABOUND! We'll introduce a new challenge for you each week for the next three FitDog Fridays that we hope will help motivate you to get and stay active with your pups! 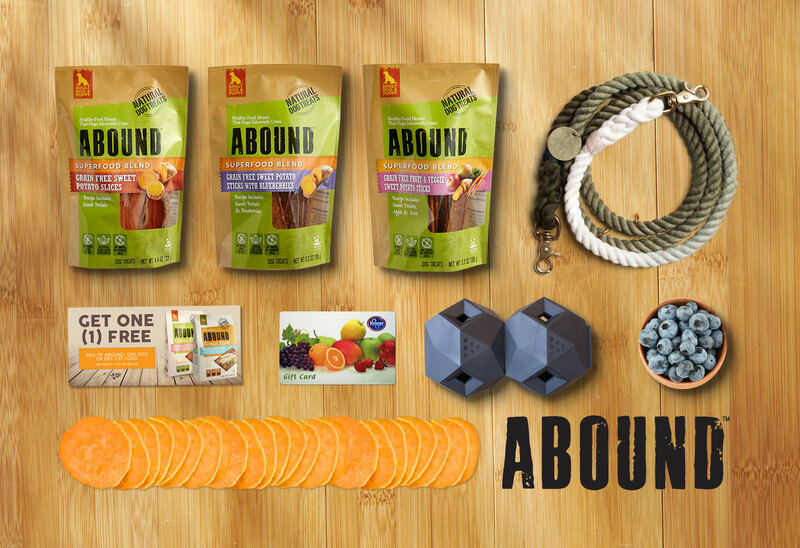 You also won't want to miss the terrific giveaway sponsored by ABOUND and filled with goodies for both you and your dog. Read all the way down for details and to enter! Here's your quick and easy primer to help guide you through the FitDog Friday Fall Fitness Challenge. What: The FitDog Friday Fall Fitness Challenge, a special event that will run every Friday in October at FitDog Friday, co-hosted SlimDoggy, My GBGV Life and us! When: We'll announce a new challenge on our FitDog Friday blog posts on Oct. 2, Oct. 9 and Oct. 16. We encourage you to come up with your own twist on our challenge and report how you did the following week by linking up your posts to our FitDog Friday Blog Hop. If you don't have a blog, don't worry! We'd love to hear about your progress in the comment sections of our blogs or on Facebook, Instagram or Twitter with hashtag #FallFitDog. Then, on Oct 23 we'll post a Fall Fitness Challenge recap with some of our favorite activities and invite you to do the same. On Oct. 30, come back for our award ceremony and the announcement of giveaway winners. Where: Link up here at our FitDog Friday blog hop, leave a comment below or join us on Facebook, Instagram or Twitter with hashtag #FallFitDog! Why: We partnered with ABOUND to bring you the FitDog Friday Fall Fitness Challenge to provide a fun way (and terrific giveaway!) to motivate you to get and stay fit and healthy with your dogs. The challenges are designed so that anyone can participate and adapt them to the activities you love best. We hope you'll share your activity ideas so we'll all learn something new! What do you do with your dog to help keep the pounds off? I don't know about you, but when I see October appear on the calendar I also imaging a big red sign that says WARNING: You are about to enter the holiday weight-gain period! Halloween (and lots of treating) is right around the corner with holiday guests and entertaining not far behind. And that means that you and your pets are likely to indulge just a little more than usual. Tell us about the activities you do to keep the pounds in check. Is there a favorite place you like to hike, walk, run or swim? Or perhaps you participate in dog sports to keep pups healthy and active. We'd love to hear what you do to keep the pounds off at the FitDog Friday Blog Hop next week! 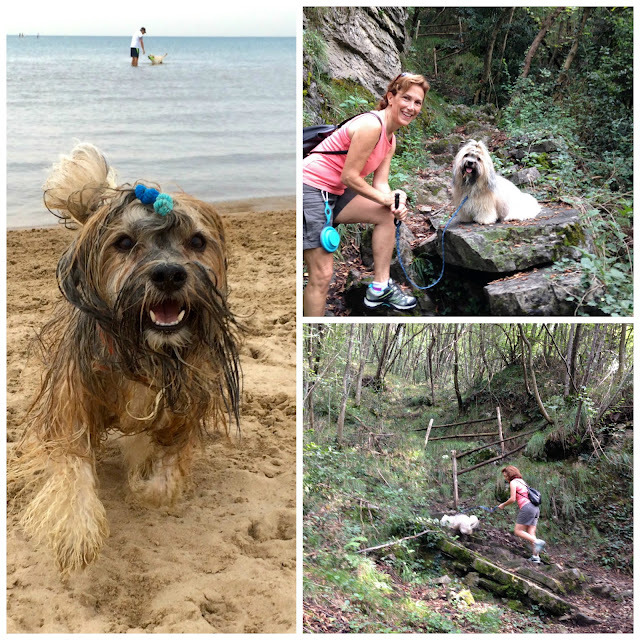 Rocco and I like a romp at the beach or a hike in the mountains to help keep the pounds at bay! ABOUND was founded on the belief that pet foods could be better, not just by a little, but by leaps and bounds. They envisioned a pet food that used all-natural ingredients, contained high-quality proteins as the first ingredient, and included real vegetables and wholesome whole grains. And for furry friends with more sensitive digestive systems, ABOUND now offers a grain free line with NO wheat, corn or soy fillers, NO animal-by product meal and NO artificial colors, flavors or preservatives. Grain free pet foods more closely mimic your pet’s natural, ancestral diet. ABOUND Grain Free recipes are protein-rich and feature easy-to-digest carbohydrates, with none of the grains that some pets find difficult to digest. Take a look at the variety of grain free dog food and treat options from ABOUND! We haven't tried all of these yet, but Rocco LOVES the one's we have tried! ABOUND Grain Free Salmon & Sweet Potato Recipe is made with high-quality protein-rich salmon to help build and maintain strong muscles as well as essential vitamins, minerals and important antioxidants help support the immune system. Made from North America sourced ingredients, the treats are full of healthy and tasty ingredients like sweet potato, cranberries and blueberries, and with a high fiber content to help maintain your pup's digestive system. Sounds like the perfect reward after -- or during -- a long walk or hike. ABOUND products are exclusively available at The Kroger Co. Family of Stores. Win a fabulous ABOUND prize pack! Enter via the giveaway widget below for a chance to win a very special prize pack from ABOUND filled with these goodies! A puzzle dog toy with a modern, modular design. Place ABOUND treats into the integrated flaps and let your dog enjoy tossing and rolling! FOUR lucky winners will each receive this prize pack, each one valued at $230! WOW! Sounds like soo much fun!! Our favorite thing is to go hiking! We LOVE to hike! Especially with our pals. We're so glad it's finally cooling off. So much nicer for walking! Yeah for fit dogs :) Cocoa and I had a good run this morning and she is resting on the couch for round 2!! Our only wish is that we three could shrink down to Rocco's size to fly places and then on landing go back to our real size. You are a good fit pal, Rocco, with a big bark! Now that would be magic! It's not too bad being small! Oh, we'd love to find a k9 pool. That sounds like so much fun! We have so many favorite activities to do together-hiking and walking, trick training, playing fetch, and more! We love the variety too! i love to take my dog on a long walk. she gets so happy when she sees horses. That's so fun that you see horses on your walks! The hubby and I like to take her hiking near a marina in our area :) she loves all the trails and smells! There's nothing like being close to the water! You're lucky to have so many parks in the area! Schooner has a Whistle which tracks his activity for me. Schooner & Skipper and my self walk 1.5 to 2 miles in the morning. We walk in the evening another mile. Since it has been cooler where we live they love walking. We have a swimming pool and Schooner (our chunky monkey) does laps with me. We play ball in the backyard and Skipper loves to chase Schooner which helps him keep active. we like to go running in my fields, i have 11.09 acres and we run together when the weather is nice. my oldest just tags along or watches now, she can run anymore. we also like to go to dog events, and expos, but have not gone much this yr b/c of the canine flu. hoping to go to get them blessed this wkend by it will be rained out. I love to go on walks with my dog. We spent this past week recovering from a flyball tournament. But we're planning on doing some nice long walks over the next week. I wear a fitbit, and have been making an effort to make sure I get a minimum of 10,000 steps in every day. When it is getting to the end of the day and I need some more steps, I grab the dog and a leash and get in an extra walk or two. Most days I've been averaging 14,000 steps, and some days I've been getting 20,000+ steps. Our favorite activity is going out in the pickup truck to check on the cows. Riding in the truck and being in the pastures never gets old for Border Collies! We love to go on hikes and long walks together and we'll try do so for as long as possible before the winter hits us. Then, we'll focus on lots of fun indoor play with training and toys. Playing and visiting at the dog park or long walks around the neighborhood are our favorites. Our favorite thing to do is to throw things and run after them to bring back to throw again. It never gets boring. Our favorite activity is agility, though we're quite enjoying nosework and barn hunt, too. We like hiking and trick training and we've been dabbling with some dog sports. We like taking a "SHORT" walk. my dog and I love to go to the park! I love going trail running with my dog. Walking around our neighborhood. Thanks so much. Shunta and I are not as young as we used to be so little walks around the block is ouir exercise routine. I like to walk around local parks with the pooch. He loves new places and smells. Our favorite activity with the dog is going to the dog park! Throwing frisbee is a favorite here.. The other is a jaunt around the 2 ponds. I don't have a dog myself but I enjoy walking my friend's dog. My dogs and I love to go swimming together! We like to walk with our dog, and he LOVES to play catch! My favorite activity with the dog is taking long walks. I like to go for walks in the woods with my dog. My favorite activity is walking the dogs, I try to walk them everyday! I love running with my dog. I enjoy playing fetch with our dog. We like to go for walks! In the fall I love to take my dog for long hikes in the woods and go to the dog park. I love to take him tp the park. I love going to the dog park with my dog. I like walking my dog in the park especially in nice weather. My favorite thing to do with my dog is to play in our big backyard and watch him run carefree through the yard. I like taking her on walks on trails. We love to go walking in our woods and around our property. She's 10 years old now, so she doesn't enjoy the really long walks anymore. I like to play fetch with my one dog, chase my dogs to get them all hyped up (LOL), and generally just love on them. To be totally honest I like cuddling and hugging my furbabies best. After that I love taking them for long walks and playing with them in yard or even inside the house. My favorite activity to do with my dog is playing and competing with discs. We are just training our puppy and trying to get him over being motion sickness on rides. We have bought a bicycle cart and have been doing small rides. Kado and I love to go hiking everyday. It keeps us both in shape and this time of year we can see all the beautiful Fall foliage. My dog and I like to go to all the fundraisers in our area that support rescue groups and humane societies. These fundraisers include the Canine Games, Bark in the Park, the Mutt Strut and all the holiday events. One of my dogs loves to chase me around the house and be chased. The other loves tug-o-war. We love to go on walks. My dog loves to walk. She'd go forever if I'd let her! I like to take my dog to the beach with us. She loves getting out for a swim. I love taking my dog for a walk around a local lake! We like to walk and some play fetch a little. We love to take walks in the park as well as cuddle and watch TV together! well, we like to nap. But my dog loves playing fetch. she chase a ball all day if I kept throwing it. We love to take our dogs for long walks! We love to go walking!! Thanks for the opportunity! our guys love to play tug of war and fetch with us. We like to go for walks. We have a large yard, and it is fun to watch the dogs play outside. I like to take my dog for walks. We like to run together. We like to go for walks around a nearby lake. I love to take him for a walk. He loves meeting people. My favorite activity to enjoy with our dogs Marley and Colby is hiking. One of my favorite things to do with my dogs is to play our version of soccer. They steal the ball and then you run and steal it back. Kicking a goal but they leap to block it. Great fun with the pups. I love to play fetch with my dog in the park. I enjoy walking our dog. We love to go to the lake and play fetch. He loves to dive into the water. i love taking him outside and watch him run around.